The Pūniu River flows from within the Pureora Forest, past four Marae: Mangataotoa, Rāwhitiroa, Aotearoa and Whakamārama through to Pirongia where it meets the Waipā River. It is a Waikato River tributory and at 57kms long, is one of the longest secondary tributaries in New Zealand. The Pūniu river holds a cultural significance to local marae hapu and iwi. The river gets its name from the Patupaiarehe (Māori mythical being of human form) that travelled down the river from the Pureora Forest seeking knowledge of the future by supernatural means. Pūniu River was once a rich source of freshwater kai and provided many picnic and swimming spots for the local people. Currently the river is not classified as being of a swimmable standard, the tuna stocks have depleted in some areas, the banks of the rivers are eroding and over 10,000 tonnes of sediment discharges into the Waipā river from the Pūniu River every year. 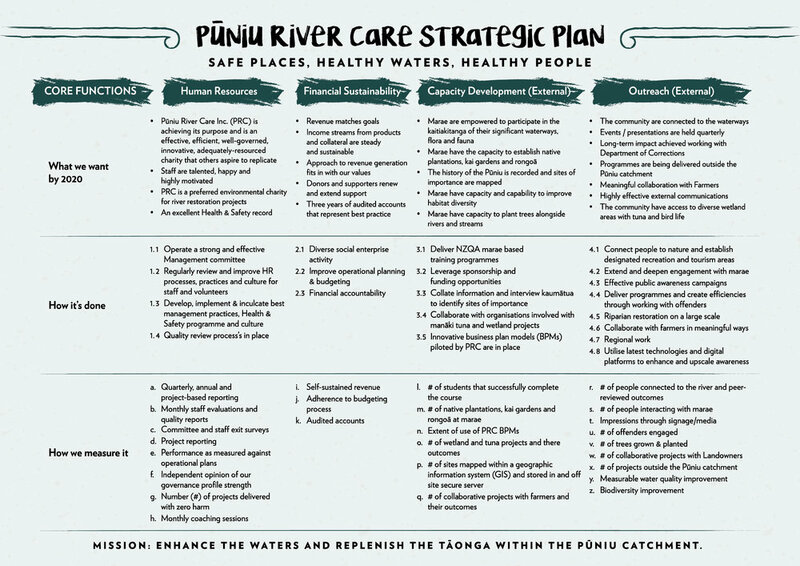 A core value of Pūniu River Care, is our responsibility to give back to the Marae within the Pūniu River Catchment. Part of this responsibility is our commitment to empower our staff to engage in the tikanga and kawa of each of the Marae which connect with Pūniu River, to ensure these practices are upheld within our people. Pūniu River Care Inc. (PRC) is an incorporated society and New Zealand registered charity. The kaupapa (purpose) of the society is to enable local hapū to be involved in improving the water quality and replenishing taonga within the Pūniu River Catchment. James Bailey (Board member- Sustainable Coastlines New Zealand) and Sam Judd (founder and chief executive officer of Sustainable Coastlines, New Zealand). In July 2015, a hui with key stakeholders was held to assist in the development of a vision and strategy for the Pūniu River Catchment. Around 40 representatives from a range of key organisations attended. The outcome of this hui was to develop a shared vision for the Pūniu River, and formulate a plan to successfully have the catchment improved and maintained to a state that people can enjoy. A strategic plan was developed from feedback gathered at this inaugural hui.